Respect the site. 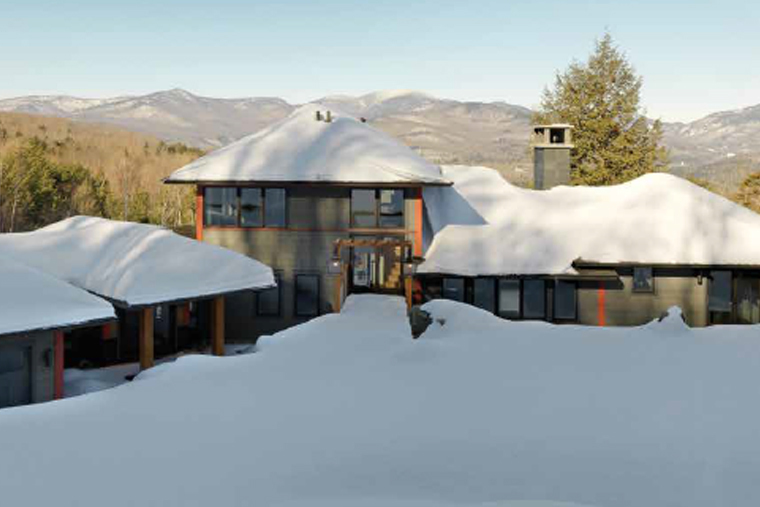 That was the prime directive in building this mountainside home in Vermont. The homeowner, a Montrealer, wanted as many rooms as possible to afford views of the hills falling away below and stretching beyond to the horizon. The idea was that anyone indoors would be able to discover the property from all vantage points. “If you have fabulous views, why have to look around something to take advantage of them?” the homeowner asks. Cushman Design Group (in the person of Milford Cushman, president, and Chad Forcier, project designer), designer Sara Tauben of SATA Interior Design, and project manager and contractor Travis Cutler, from builder Donald P. Blake Jr. Inc., provided the answer with a horizontal stretch of house nestled into the hillside halfway down the property. Respect the environment was also a major directive. 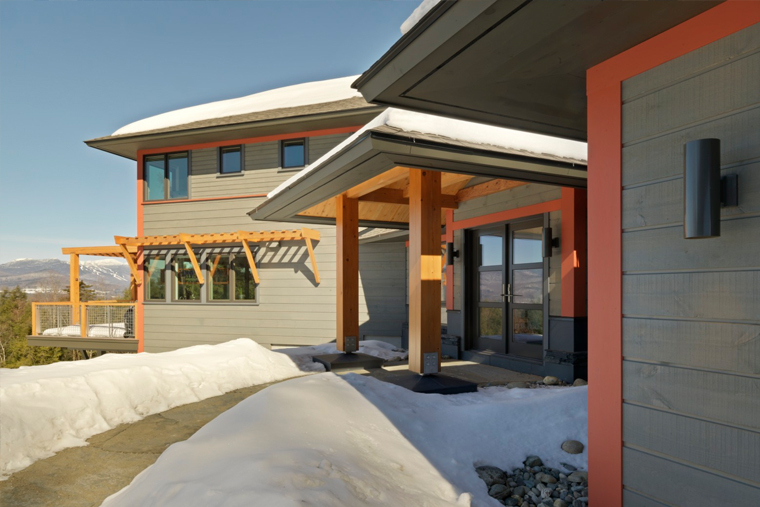 “The homeowner demanded that the building be extremely energy efficient,” says Cushman. “This house meets double the standards of the Vermont code, and Vermont is much more stringent than most states. Just as the interior is connected with the outdoors visually, Tauben ensured that the outdoors was brought indoors. 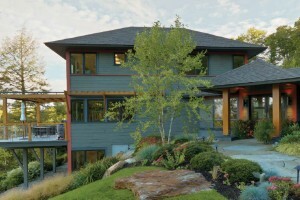 Natural elements are in evidence throughout the 4,500-square-foot dwelling. For instance, in the space between the vestibule and the main building, a serpentine path of river rock is set into a slate floor. 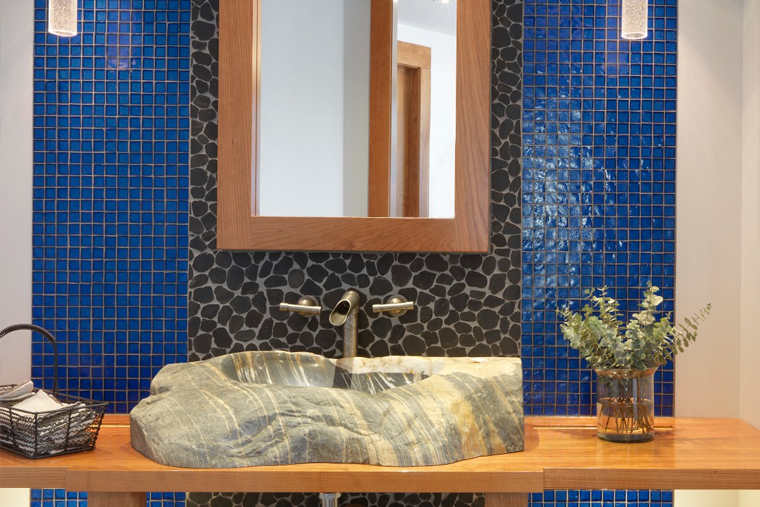 The path leads past some birch tree trunks (filling in a corner and extending into ceiling space) and on to a powder room with a hand-hewn sink carved out of a boulder by Chris Curtis of Stowe’s West Branch Gallery. “The birch poles were a playful choice,” Tauben says. “The whole hillside was birch forest that we cut down. 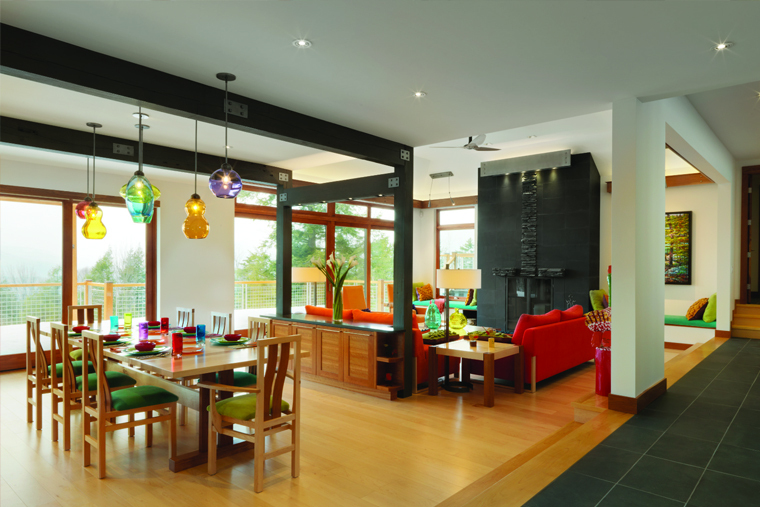 The poles bring the outdoors in, and they’re a great contrast to the primary colours in the house. And of course, wood brings the outdoors in. 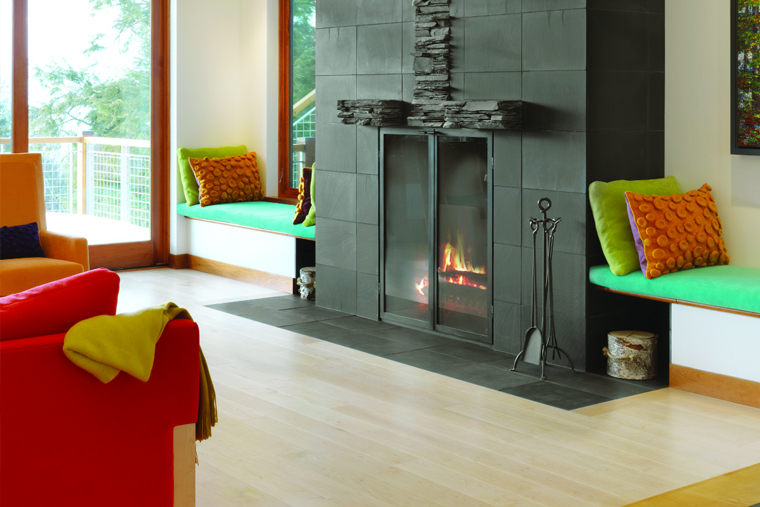 Tauben used three woods throughout the house: cherry, maple, and dark-stained salvaged wood. The walls are the same white everywhere, “almost a blank canvas for colours to fall into place,” says Tauben. Those locally made items often inject yet more colour into the place. Tauben makes extensive use of colour to satisfy a playful sensibility. It runs riot throughout the house, appearing in not only such expected places as upholstery and accessories but also more unusual locations. For instance, all the doors (and some of the concrete floors) on the lower level are painted red and have cherrywood trim. 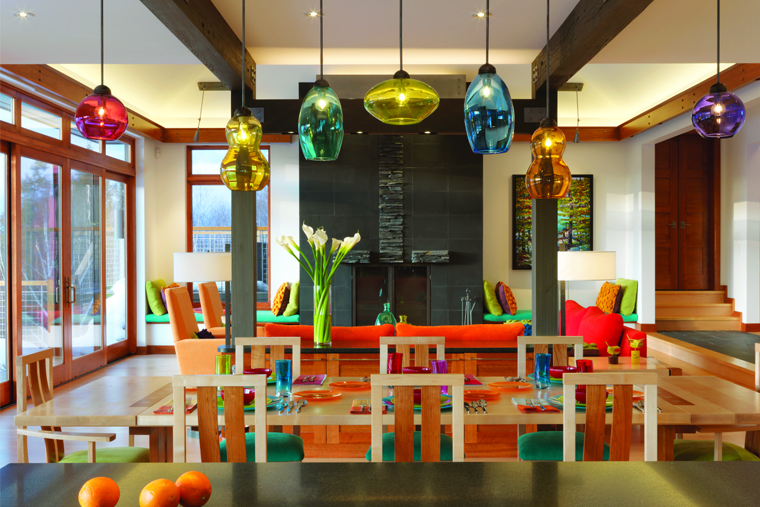 Some of the colour comes from items Tauben sourced for the house, and some from the homeowner’s folk art collection. “I wanted to pick up on that in a sophisticated way, to be playful,” Tauben says. “Once you start, you play some more. This is the most colourful interior I’ve ever done.